Rising Adventure Pvt. Ltd. provides an opportunity to have a Mountain Flight every morning in the Everest region where everyone wants to go. The starting time of first flight is at 6:30 am in the morning from Kathmandu Airport. It takes almost one hour to visit over the Himalayas region. Mountain Flight is very suitable especially for those who are time bound and for other interested groups too. Doing Everest Flight is as equal as going to trekking for looking the closer live sceneries of mountains. While doing Mountain Flight along the Everest region, the mountains come closer to closer. 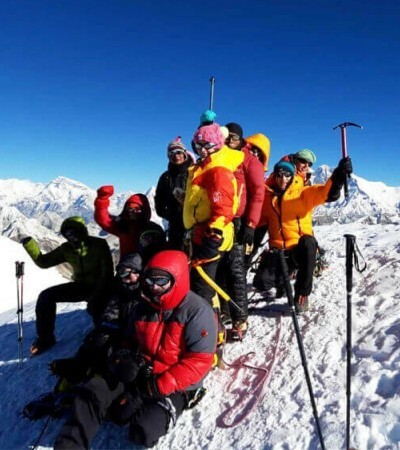 First of all, you will see the panoramic beauty of Shisha Pangma Mountain at 8,013m. Then, there appears a heavy snow covered Dorje Lakpa Mountain at 6,966m immediately at the right side of Shisha Panga and beside Dorje Lakpa, you will have a glance at the stunning views of Phurbi- Ghyachu Mountain. At second, there lies spectacular vision of Choba- Bhamare Mountain and then Gauri- Shankar Mountain in a chronological order. According to Hindu mythology, the Lord Shiva and his consort Gauri live on the Gauri- Shankar Mountain at the proud height of 7,134m and till 1979 AD no one had got succeeded to summit it. However, the Gauri-Shankar Himal is sharp and very conspicuous during the Everest Flight. Besides them, you will see other Himalayan ranges including the worlds highest mountain i.e. Mt. Everest. Some of them are given below.